The Government floated the creation of a national identification scheme during 2005-06. The APF campaign ran this vital and highly successful campaign from April 2005 until 26 April 2006. By then, multiple Liberal Ministers and backbenchers had become very nervous about it, and the rhetoric about it defeating terrorism was noticeable by its absence. It was subsumed into what the Government dubbed a 'Human Services Access card'/ 'SmartCard'/ 'ConsumerCard' project. For the continuation, see APF's new national ID card campaign, 2006-. A Case for a National Identification Scheme? Is this the biggest privacy threat this year? If so, nominate it for a Big Brother Award! On 14 July 2005, Queensland Premier Peter Beattie wanted to divert media attention away from serious problems relating to the inappropriate detention of Australian citizens and residents as 'illegal immigrants'. So he proposed that a national identification scheme was needed. On 15 July 2005, the Prime Minister was facing his own problems, and grasped the opportunity to put the ID card back on the political agenda. During the next few days, this caused consternation among his Ministers, whose positions had been the complete opposite. But many of them were under serious pressure at the time as well. Demonstrating the adaptability necessary of politicians, they abruptly changed their tunes. But the Cabinet was badly out of touch with its bankbenchers as well as the Australian public. A few days later, serious dissension was apparent within Liberal Party ranks. Some quotations and media reports are provided of the continually changing positions adopted by Premier Beattie, Prime Minister Howard, Immigration Minister Vanstone, Attorney-General Ruddock and Customs Minister Ellison. Background information is also provided on which business interests appear to have prompted the Prime Minister's re-kindled interest in a national identification scheme, and on the discomfort felt by many members of the Liberal Party. On 23 July 2005, The Canberra Times reported that "A Morgan poll [an Australian-wide cross-section of 651 men and women aged 14 and over] conducted by phone on Wednesday and Thursday [20-21 July] found that 62% of Australians agreed with the introduction of a national ID card with a photograph, while 32% opposed it, and 6% were undecided. Pollster Gary Morgan said "Australians are clearly in favour ... This is driven by the fear of terrorist attacks and illegal immigration. ... Clearly many people would like to see the identification card replace other forms of identification, but there are still some concerns regarding privacy and the effectiveness of the card in combating terrorism". (If 1,250 nationwide is computed to achieve +/- 4% accuracy, then 650 probably achieves +/-10%). Morgan also offered the figures he got back in July 1985, in the early stages of the original Australia Card campaign: 68% in favour, 25% opposed, and 7% undecided. On 2 August 2005, the Next technology pages of The Sydney Morning Herald and The Melbourne Age discussed at length how the proposal had nothing at all to do with terrorism, and The Australian IT Pages reported the APF's critique of the idea. After a 3-week flurry, the topic went quiet for several months. But moves were afoot. It doesn't appear to have been publicly known at the time, but at a meeting of the Business-Government Advisory Group on National Security on 12 August, Attorney-General Ruddock apparently raised for discussion the Australian Government's consideration of a national identification card. See ACCI (2005). On 4 October 2005, The Sydney Morning Herald reported that "A new national identity system will be considered at today's federal cabinet meeting". This linked the idea to the Government's attempts to re-build the Department of Immigration after a series of instances of gross mismanagement had become public, and the Government had moved on 11 of its 12 most senior executives. On 11 December 2005, a report in The Telegraph provided a spurious linkage to the arrest of 18 men in Sydney and Melbourne in November on charges related to terrorism. Also in December, the Government gained passage of additional, quite extraordinarily privacy-invasive legislation, with the assistance of a meek and compliant Opposition, despite the flood of criticism and evidence to a Senate Committee, and the opposition of the entire legal profession. On 21 December 2005, the Australian Chamber of Commerce and Industry (ACCI) reiterated its firm opposition to the introduction of a national identity card. The full report was summarised in The Sydney Morning Herald of 21 December: "A national identity card would cost the Australian economy up to $15 billion and may do little to stop terrorists, the business community has warned. Mr Hendy said overseas identity cards had cost up to $750 per person - or up to $15 billion in Australia - to develop and introduce. There also were additional costs on businesses in flow-on effects. ACCI believes even at $7.5 billion, the cost of an identity card would out-weigh the cost of identification fraud. ACCI found in its research into an identity card that just four countries - Malaysia, Singapore, Hong Kong and Cyprus - had introduced identity cards in peace time". On 29 December 2005, a report in The Australian said that Ruddock was to "present the findings of a departmental review of the new Australian Card proposal to cabinet early next year". It referred to the issue having been put back on the agenda by Howard "following the London bombings in July". On 10 January 2006, The Australian reported that " Nationals Senate leader Ron Boswell, a fierce opponent of the Australia Card proposal 20 years ago, said yesterday that times had changed and an ID card should be reconsidered. ... the London and Bali bombings last year were reason enough for the issue to be looked at again.... Attorney-General Philip Ruddock will present the findings of a departmental review of the new Australia Card proposal to federal cabinet by the end of March. Maverick Queensland Nationals senator Barnaby Joyce said his first instinct was to retain the firm opposition he held against the original Australia Card proposal. However, Senator Joyce said in light of terrorist threats he would keep an open mind to the issue if it were presented in the wake of the Attorney-General's review of the proposal". PRESENTER: So how does an ID card help to prevent terrorism? PRESENTER: People from abroad? They won’t have an Australian ID card? ATTORNEY-GENERAL: ... The point I’m making is that if you do have a universal system of identification it makes it much easier to identify those people who are not included in the system. The Editorial in The Australian on 17 January was entitled 'Now convince us, PM'. Vanstone twittered on about 'a photographic card matched against a fingerprint database' "solving overnight" immigration detention problems like the Cornelia Rau case ('Identity card way to prevent Rau case: Vanstone', The Adelaide Advertiser, 25 January 2006). Rau was carrying none of the many forms of identification that she owned; so how would an Australia Card have made any difference?? The very same day, Howard was making the much more sensible remark that "Nobody should assume that I am committed to an ID card. They shouldn't. ... What I've said is that the new circumstances of terrorism required that we look at the thing again. That does not mean that we are definitely going to do it. It does not mean that I've decided that we should do it" ('Howard not committed to ID card', The Sydney Morning Herald Online, 24 January 2006). On 1 February 2006, The Australian reported the results of a Newspoll. "The ID card now under consideration by the federal Government" scored 53% for and 31% against. The groups most strongly in favour were "people over 50" (63%) and "Coalition supporters" (60%). 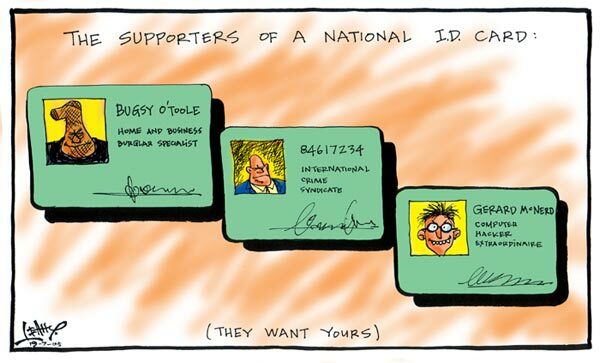 At the starting-line in 1985, 73% of those polled were in favour, so the public is already vastly more sceptical this time around ('Most support national ID card', The Australian, 1 February 2006). This was followed up on 2 February in both The Australian and The Australian Financial Review: "Australian Privacy Foundation chief Anna Johnston said yesterday's poll was good news for those who opposed the ID card, despite indicating a majority of Australians supported the proposal. She said the lower level of support for the ID card compared with 1986 showed that people were better informed". Ruddock was stampeded into the defensive statement that "It doesn't have to follow that the introduction of a national ID card would have any impact on privacy at all". On 6 February 2006, The Sydney Morning Herald Editorial (not a noted champion of privacy rights) said: "The value of a national ID card will be in direct proportion to how much it can reveal about the person who holds it. And once established, there would be continuing pressure to expand its scope. Technological change means such a card would now pose far greater challenges to liberty and privacy than the Australia Card suggested by the Hawke government in the mid-'80s. The controversy about individual rights and freedoms will burn far brighter now than two decades ago". Protagonists in mid-July asserted that a national identification scheme would help in the fight against terrorism, and could prevent wrongful detention of citizens. Based on the Privacy Foundation's long experience, we know that they'll soon dredge up the old favourites of drug-runners, organised crime, illegal immigrants, and welfare fraud. Protagonists also say that the world has been changed by terrorism, and that the Australian public will now accept even quite extreme restrictions on civil liberties, as the price of not being killed by terrorists. Unfortunately, the politicians have limited themselves to mere assertions, and have produced no evidence of how a scheme would actually achieve the benefits that they claim. They hope that their public servants will be able to produce documents that will bolster their statements. The first step that the politicians should take is to understand is that it's not just about a card, and it's not just about a database. Many elements make up a national identification scheme. 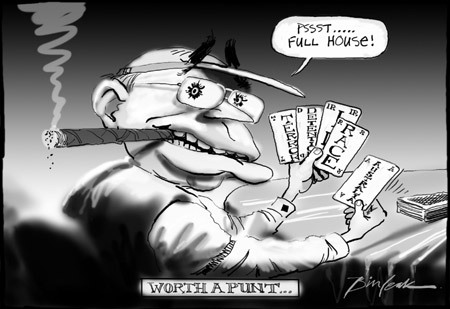 Cartoonists' opinions on the benefits of the scheme were offered on 19 July 2005, by Fairfax cartoonist Moir (inspired by a letter to the editor that day), by a cartoonist at The Australian (reflecting the news reported on the same day, that an Australian had just won a poker competition in the U.S. worth $A10 million), and by Leahy in The Brisbane Courier-Mail. Many similar sentiments were offered by authors of letters to editors of major newspapers. This section provides an explanation of why a National Identification Scheme is an extremely bad idea. We've tried to keep it reasonably brief, while covering the main issues. Access is provided below to the substantial literature in support of this case. 1. ID Cards won't stop terrorism. A national identification scheme would not have prevented the terrorist attacks in the U.S.A., Bali, Madrid or London. (Terrorism uses 'virgins'. Their identity is unknowable until after they've acted. And most of them only ever commit a single terrorist act). The Minister responsible for the UK ID card proposal stated very clearly that "Identity cards would not have prevented the bombings" (The [London] Daily Telegraph, 09/07/2005). 2. ID Cards won't stop immigration bungles. A national identification scheme would not have done anything to prevent the wrongful detention of Cornelia Rau. Ms Rau could have used any number of existing items of evidence of identity. She chose not to. So she wouldn't have been carrying her 'New Australia' Card either. And a search of a database of millions of people is fraught with enormous technical difficulties (not to mention an error-rate in the Department's database that the Auditor-General estimated at a startling 30%). The Palmer Report proposed a national missing persons bureau. That's a proposal that is worth considering, because it's specific, targeted and practical. there is a need for 'official false identities'. (The largest creator of identities isn't organised crime, but governments. Without that capability, spies, undercover policemen and protected witnesses are in great physical danger). An official system for exceptions is readily accessible by organised crime. 4. A national identification scheme means greater government intrusion into our private lives. Our freedoms would be harmed because the power of public servants would be greatly increased. This would restrict our willingness to express our personalities the way we'd like to. It would make us all less prepared to take risks, and hence reduce our innovation. Because our economic growth is dependent on our cleverness, over time our standard of living would be lowered. Very importantly, we'd feel less free to express political opinions, so our participation in democratic processes would be much-reduced. 5. Because of the enormous privacy implications of such a scheme, it is crucial that anyone who proposes a national identification scheme demonstrate that it would have very substantial advantages that outweigh its huge negative impacts. Politicians have made many assertions about a national identification scheme helping address major problems, but they haven't backed up their assertions with evidence. 6. The politicians concerned have very little understanding of the business processes and technologies involved in identification and identity authentication. To be fair, it's a complicated topic, and politicians are generalists, whose job is to stay in government rather than to actually solve social problems. But there's plenty of guidance available to them if they took the trouble to do some research before they opened their mouths. 7. The result is that, when politicians start a media campaign for identification schemes as an antidote to terrorism, they're actually failing their public responsibilities. They're trying to make it look as if something's being done to protect the public, when that's not the case. 8. Part of the problem is that politicians who raise the prospect of a national identification scheme do so in order to divert attention from the real problems that confront the country, and their parties. (During July 2005, a dozen senior government executives have been sacrificed so that Immigration Minister Vanstone can keep her job. 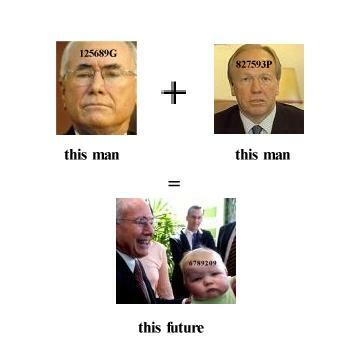 Prime Minister Howard is facing pressure to retire. 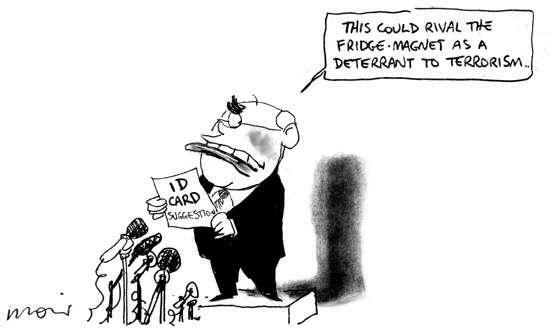 Attorney-General and ex-Immigration Minister Ruddock's mania about security-at-all-costs is increasingly unpopular. Queensland Premier Beattie has a health care crisis on his hands). Politicians should address the real problems directly, instead of looking for a magic bullet. every government system needs to run its own identification scheme, appropriate to its needs, and silo'd from other identification schemes. Specific-purpose ID systems with appropriate levels of security are appropriate, whereas multi-purpose ID systems are too dangerous particularly because of the inevitability of further function creep. The Australian Government is pushing for the multiple use of small numbers of identification schemes, and hence the breaking down of the silos that protect people's privacy. In doing so, the Government is making the faulty assumption that it will deliver economic efficiencies, and valuing social control far more highly than the interests of Australian citizens. 10. If politicians get their way, and a project is started to examine a national identification scheme, multi-millions of tax-payers' dollars will be wasted, as public servants prepare briefs for a scheme that will never be implemented. It will never be implemented, because, once the public realises what it involves, the project will be scrapped.